Human energy has, after all, its limits. Another marathon game of the American grandmaster ended with his dramatic loss and revival of the outsider. Black did not solve the opening problems. An attempt to return his passive bishops into action only led to trading both of them (note the highly accurate 18.Rde1! 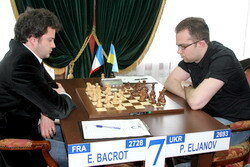 ), and White obtained a long-lasting advantage due to the superior bishop. In the endgame White got an adjacent passed pawn, and it looked like he is winning easily. However, one has to know Kamsky! He can create problems for anyone and in any position. Maybe Akopian could play more powerfully (for example, I didn’t find any chances for Black after 52.f4, on the next move White could win by 55.a6!, etc), but generally the Armenian handled the game with confidence. The roller coaster started on the move 62, when both players were already very tired. White missed a quick win – 62.Rc7!, intending to bring the bishop to c5. Maybe Akopian missed that after 62…Nxa3 63.Kxa3 Kd6 he wins the critical tempo by 64.Rg7! – or perhaps he didn’t want to play Q vs R ending after 64…Rxg7! However, after his 62.Rb7? the position became drawn! Gata could survive by 65…Nd8! In the endgame with an extra bishop and a pawn on a7 Vladimir correctly sacrificed the pawn (74.a8Q+! ), but later, as the players approached the third time trouble, began to play very indecisively. An unbelievable blunder 93.Be7? was the anti-climax of the game for the Armenian, but it turned out that Gata ‘Made of Steel’ Kamsky also ran out of steam. Instead of capturing on e7 with the rook, which led to stalemate, he continued the struggle is the most unsuccessful way, allowing the opponent to win without showing advanced textbook endgame knowledge. Despite the number of errors made in this encounter, I sincerely admire both players, who showed a lot of spirit and produced a highly entertaining game. One of the favorites of the tournament was crushed in 25 moves! The opening stage was not very eventful; the resulting position was playable for both sides. It seems Vassily lost concentration and did not smell the danger for his king, otherwise he would care returning the queen that stuck on the other side of the board. White cracked on the 22nd move. His 22.Bf1? is a big blunder. Both 22.f3 and 22.Rf1 would give him a solid and approximately even position. However, the first option weakened the pawn structure, while the second one was hard to pick for psychological reasons, as Ivanchuk already played Rf1-d1. Kasimdzhanov’s final combination was both spectacular and efficient. In the variation 23.exd4 Nxd4 24.Qd1 Black can offer another sacrifice: 24…Ndf3+! 25.gxf3 Nxf3+ 26.Kh1 Qf4! with deadly threats. 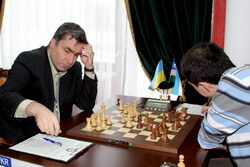 In the final position of the game Rustam prepared to meet 26.Qd3 by 26…Qxc2 27.Qxc2 Qxf1+!, winning a piece. The youngest participant of the tournament was unlucky to miss half a point. In the Paulsen Sicilian Sergey demonstrated an excellent novelty 8.Qg3, which gave him very strong initiative for a pawn and more than an extra hour on the clock. One has to win in such situations! However, Shakhriyar did not lose his composure and made several excellent defensive moves. The critical position occurred on the 16th move. It seems White must have a big advantage, but concrete variations do not prove it. He could transpose to a better endgame by 16.Ne4 Qg6 17.Nxd6+ Bxd6 18.Bxd6 Qxg3 19.hxg3 – the bishop pair and active White’s rooks must play its role. However, will it suffice to win? No one can be sure. After Karjakin played the most natural 16.h4, Mamedyarov found great defense. He gave up the e5-pawn and provoked useful exchanges. White’s advantage in the resulting endgame was purely symbolic. Attack and defense were equally strong in this game. Bacrot made a good novelty in the Zajtsev Variation of the Ruy Lopez – 18.Bxa5, then nicely sacrificed a pawn by 24.Bb3!, seizing the initiative. His bishop on d5 was much stronger than its Black counterpart. However, the analysis confirmed that White was never really close to a win in this game! There were many tempting sacrifices, but none of them was decisive. In each line Black could escape to a draw. Neither 30.Rf3 Rf8 31.Rxf7, nor 31.Rxh7 or 32.Rxh7 worked for White. And Eljanov defended accurately until the end. The last precise move was 33…Ra4!, after which White no longer had any attacking potential. Aronian tested an interesting innovation in one of the Marshall lines – 16…Qf5 (earlier Black only tried 16…Qh5 and 16…Rae8). The idea is to avoid trading the queens and leave the path for the h-pawn. 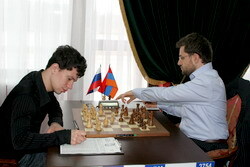 Alekseev continued playing in a standard way, and soon his position became dubious. Black created strong pressure against g3. However, there was no concrete way to convert it into something real. As often happens in this variation, the compensation was sufficient to equalize the game, but not more. White correctly abandoned his extra pawn on the 36th move and went to a drawn ending with opposite-colored bishops. 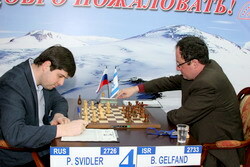 Gelfand proved more knowledgeable in the Moscow Variation of the Slav Defense. By 16…Nf6! Boris improved Black’s play in Ivanchuk-Karjakin, Nice 2009, and then delivered a huge blow 18…Bh3! This move wasn’t as strong objectively and it was stunning psychologically, but it worked: Svidler didn’t manage to equalize the game. Here is one of the possible ways: 19.Qb3! Rad8 20.Qxb7 Rd7 21.Qb3 Bxg2 22.Bxf7+ Rxf7 23.Kxg2, and after exchanging on d4 the game is equal. In the variation selected by Peter, White can also defend better: 21.Qg4! Qxg4+ 22.hxg4 Bxd4 23.exd4 Rxd4, and now, instead of 24.h3?! Rd2! White plays 25.f3!, and the rook defends the second rank from f2. Having missed these opportunities, Svidler was forced to suffer. If Gelfand abstained from 32…h5 and played 32…Rf6! with the idea Rf6-a6, it is quite possible that suffering would eventually end in resignation. The point is that in this case Black’s extra pawn would appear on the queenside instead of the kingside, with means a much better promotion prospects. Boris overlooked it, and the rest was nice and clean. 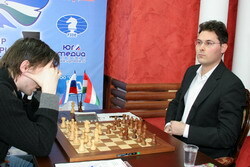 Svidler did not miss his chance to make a draw. This game became another milestone in the theory of the Anti-Moscow Gambit of the Slav Defense. Peter employed an interesting new move 16…c5!? (instead of 16…Kf8), allowing White to regain a pawn, but completing development. The exchange of the queens that followed gave White only a slight advantage in the endgame. Logical play of both sides inevitably led to a draw.